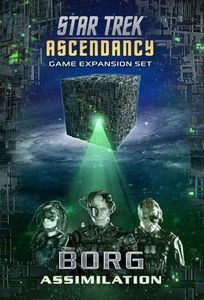 Star Trek: Ascendancy – Borg Assimilation adds an all-new threat to the game. The Borg are an independent menace, attacking players' ships and assimilating civilized worlds. If the Borg are not dealt with, they could overwhelm the Galaxy. Can the great civilizations put aside their rivalries long enough to face the Borg as a united front? Or will they try to combat the Borg onslaught individually, seizing Borg technology for themselves?